If Art is an enhancement of the everyday is this door Art? Feel the surface of the wood and breathe in the smell of wood. Follow the grain of the wood, the imperfections, the differing tones in the colour and experience the pleasure that comes from noticing these things. Feel that strangely soft surface with your hands; the soft fuzz not yet flattened by the varnish to come – like the soft facial fuzz of your skin; consider the colour and its variations; become aware of the structure of its build, the line of screw heads that mark out the frame that lies between the skin of the ply. Let the size of the hinges hint at the weight they hold. The hinges are magnificent, they are large, their beautiful throat is large. They make their own statement. The rectangular handle in satin steel complements the hinges. Notice the height of the handle. It is not set at regulation height and you must consciously raise your arm a little in order to use it. Perhaps it positions you differently in relation to the door, reminding you that a door is a tactile thing. Having decided to replace an internal door it was important to me that the new door reflect thoughts I have about the house I live in. This house is 1970s ex council, small and not as solid as earlier models. 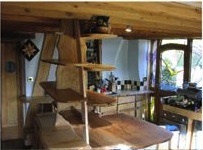 The ground floor of the house had been altered and is now open plan. This led to thinking about the construction of the whole. How some features seem a little mean, like the cavity walls that were built just slightly narrower than would accommodate insulation. 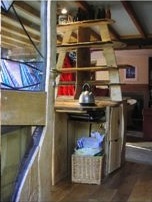 See this in contrast to the staircase, which is solid and generous. The internal doors however are merely functional and carry an overall feeling of lack of care, of being unnoticed. These doors are mass produced, inexpensive and, although adequate, perhaps easily damaged. This is evidenced by one door upstairs that shows the mark of a boot. I suspect a little violence in its history. Should not an object that is as important to the life of a house as a door deserve better? Artists, architects, designers, have always considered our environment, questioning how we use or abuse it. Art and life are inextricably linked; think of the arts and craft movement, de Stijl and the Bauhaus. Modernist architects, like them or not, were also interested in developing the spaces we live in, mixing art and life. An internal door in the house le Corbusier designed for himself was tall and wide, a part of the whole wall as well as an opening. And now the new turner prizewinners, Assemble, a cross-disciplinary collective of artists, designers and architects, who have won a major art prize yet do not consider themselves artists. Or are they? Everyone mixing art and life. The places we live in speak of who we are, what we care about, and a door, it seemed to me, could have a story to tell. So; the door. Made, built, constructed by a craftsman. A carpenter, someone who loves wood, knows wood, knows how to build, to make, to construct a door. A hands-on skill. All this feeds into the story. Examine this door and it will tell you more. You will see how it was made and what it was made of. It was made of plywood. Plywood is a basic economic and ecological material, it shows its structure and you can see the layers that attest to how it was made. It is ‘everyday’, has many uses and comes in different grades. It is unassuming, unpretentious and beautiful. To have a door that revealed how it was made, made of a wood that revealed how it was made, fitted in with the wider concept of the house as structure revealed, the house as installation, and the house as function. The house as a site for art. A pencil mark notes where measurement was made. 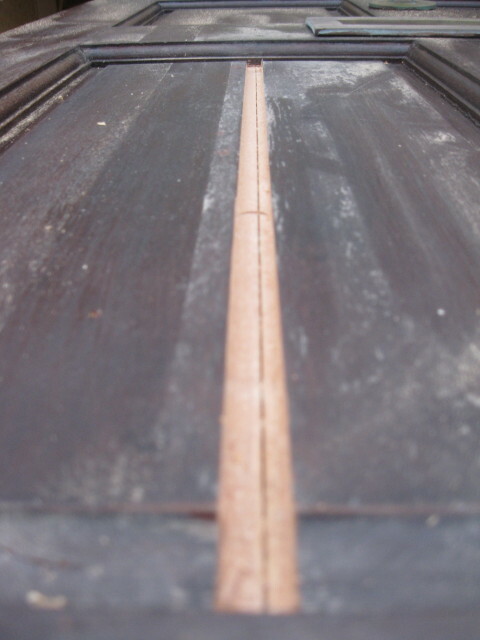 A kink in the frame will mark the point of a knot in the wood. Being able to read how this door was constructed adds to the pleasure of this functional object. The outer edge of the softwood frame is visible when you open the door, so too are the layers of 12 mm plywood either side of the frame. Three layers to each sheet of ply thereby marking its own construction. Screw heads testify to the structure of the hidden part of the frame where they fix the plywood outer skin to the pine frame within. A visual reference connecting this modern door to doors in time past. The ‘threshold’ lies at the top of the door along the ceiling mirroring the ‘threshold’ and the door on the floor above. The ground floor flows uninterrupted beneath the door. This door is not the readymade of Duchamp that is taken out of its original context in order to see it differently or to question what art is. It is the desire to value the everyday object – a strong theme throughout the story of contemporary art – and in turn to value and think differently about the places and spaces we inhabit. This door is connected to ideas of art and architecture and the sheer pleasure to be had in a well-crafted functional object in everyday use. The aesthetic comes from the materials used and the function of the object; from following the theme of construction and functionality, from valuing skill, craft and the ecological aspect of materials. If art is an enhancement of the everyday then for me this door is art. 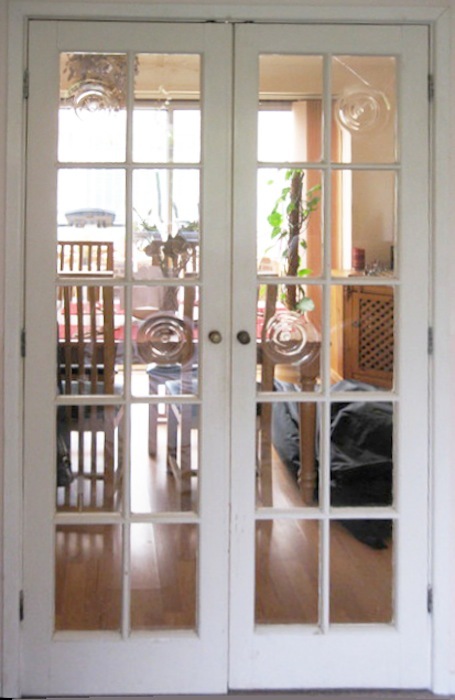 Previously a UPVC door was fitted which was not in keeping with the rest of the interior of the house. This particular door lets in light whilst giving privicy with its obscure glass it was fitted inside the porch into the original main entrance opening. 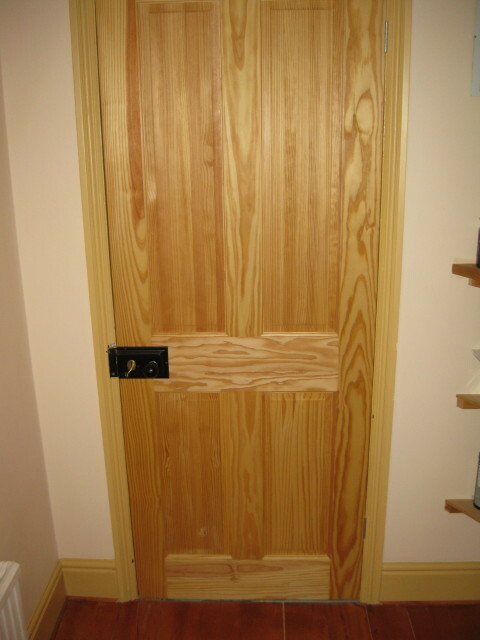 Four panel clear pine internal door fitted with a Rim Lock and knobs. 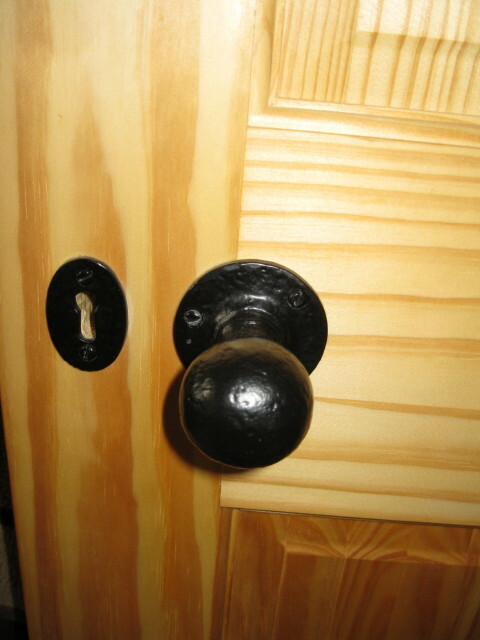 Rim locks make an atractive and functional addition to internal doors not seen so much now they were very common in victorian houses. 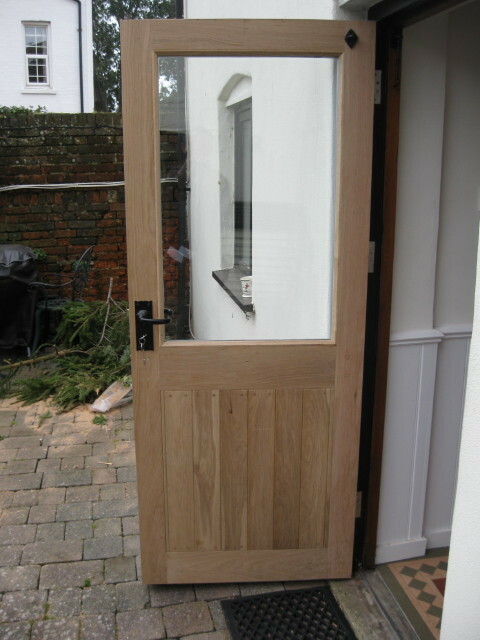 Bespoke Oak Door made from American White Oak with Oak TGV panels. 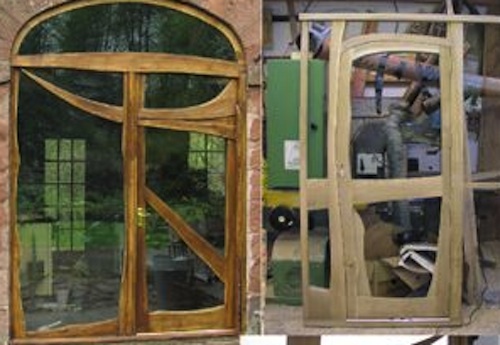 The images show the manufacture and assembly of the door through to the door fitted in its final resting place. The door needed to be made because the dimensions required were not an off the shelf size, i used through mortice and tennon joints and pegged these through the stiles with 12mm Oak dowels to make sure that it remains stable due to the location of the property where the door was fitted -on a water front property facing south west- so its going to get a battering from the elements. The exterior of the door and the edges have been finished prior to fitting with 3 coats of marine grade primer its an aluminium based paint where microscopic particles of aluminum ‘knot’ together to give a tough barrier the customer will finish the door with marine grade undercoat and gloss. 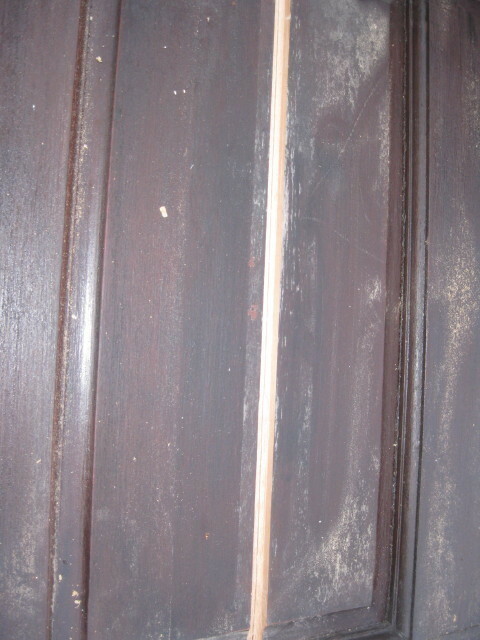 The interior of the door can be polished or waxed to show the grain. 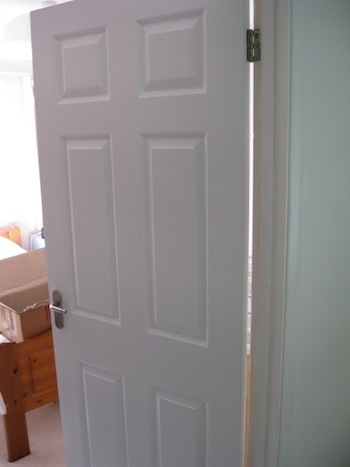 These replacement doors are six panel grained doors with contemporary handles. This style of door is known as a moulded door and comes in a variety of styles: six, four, or two panelled, grained or smooth. You can also get arched-top doors in all sizes from 1ft 8″ to 3ft, in both metric and imperial sizes. I can also supply many other styles of doors, in hardwood and soft wood, interior and exterior, with many glazing and security options. I’ve got a thing about doors (I guess someone has to) and will often take time to stop and marvel at a hand made door when out and about, and appreciate the workmanship and design that has gone into it and its functionality. I have studied doors that are well over 300 years old and are still being used as a main entrance door. Simple maths tells me that if it is only used twice a day that’s an incredible 434,400 times that it has been used. The beauty is that the basic principle of door construction has not changed that much: mortise and tenoned with twin tenons on the centre rail, with the better ones being wedged tenons. There are some examples of fine doors in Southampton, particularly around the older parts of the City Centre, Polygon, and Highfield. Changing your interior doors will have an immediate impact on the ambiance of your home. Hallways or landings may well be more door than wall for example, where there can be up to six doors in a relatively close space. 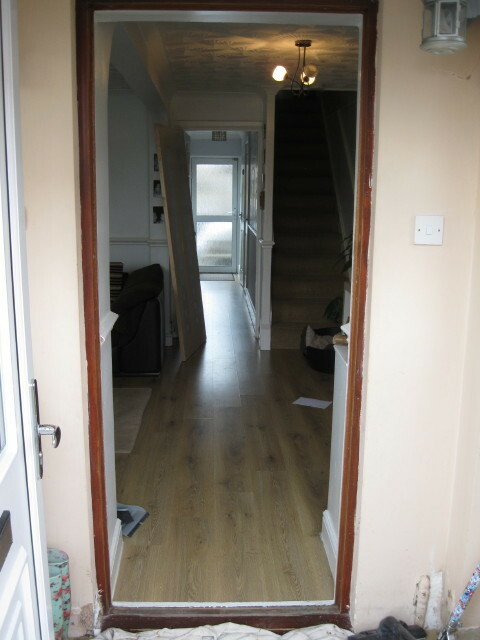 If you have a dull or darkened hallway, changing the doors will transform this space. The main entrance door, that is your front door, will be your first line of defence against the outside world. Your door’s style and choice can say to the world “welcome” as well as “we are secure”. A quote from ‘The Poetics of Space’ by Gaston Bachelard conveys this perfectly: ‘With their furniture of lock and key, handle and hinge, letterbox and knocker, doors open to communicate and embrace, close to protect and hide’. Back doors, according to recent statistics, are the first choice of attack by would-be intruders, if access to the back garden can be obtained, and that doesn’t necessarily have to be via a side gate either; a neighbour’s back garden that adjoins onto the target is often used. Burglars prefer this as the back garden is often hidden and out of sight. Having robust security on the main entrance door and compromising on the back door is a false economy. So where do you start? Let’s say you wish to replace your internal doors. You may have an idea of what you would like. You’ve even been along to a supplier and taken a look. Briefly, start with measuring what you have – the width and the height and the thickness. There is no such thing as a standard door size; there are common sizes, however. These are 27”,30”, 32” and 33”. Most doors are probably 78” high or thereabouts, apart from the 32” which commonly is 80” high. Bathrooms and kitchens commonly have 27” doors, whereas 30” are common to living rooms and bedrooms. Because the majority of the housing stock in this country is pre 1971 (pre-metric), the door industry still adopts the imperial measurements when it comes to supply. However, many suppliers adopt imperial sizing for width and height but metric for thickness, so you could end up having a conversation where you order a 2’6” x 35mm door, 35mm being the thickness of most internal doors. 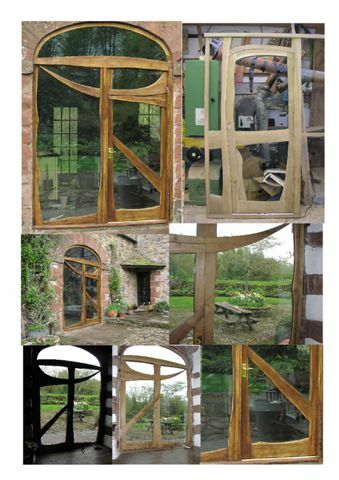 Unique stunning and individual, these doors are handmade, designed for everyday use, and create a unique feature in your property (no two are the same). They are made in a variety of hardwoods. If your doors are not 35mm but 40mm thick, this usually means that you have metric doors. These are commonly 626, 726, or 826mm wide and 2040mm high, although other sizes are available. An exception to this rule would be imperial width fire doors that come in the sizes stated previously, but which are 40mm thick. On the other hand, a few years ago internal fire doors became available in a 35mm format. At this stage, bear in mind that the actual door you are replacing maybe under-sized. An example is a nominally 30” door which now is actually 29.5” by 77”. This is not unusual. 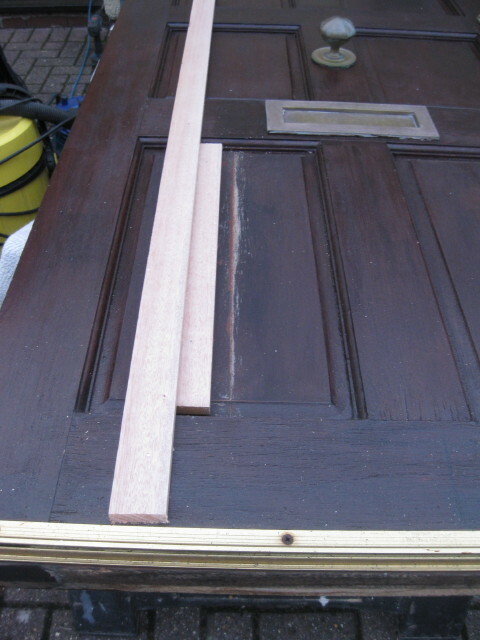 Most doors need to be shot-in (cut to size when fitted). That’s where it starts to become apparent that you need a carpenter. If you live in a pre-1930s property, you may have a 28” door that is 72” high and maybe only a 1” thick. To date I know of no supplier that has these sizes off the shelf, so a handmade version of what you need may be your only option; this is something I can advise you about. Often I hear householders say that they would like to keep the door but it’s a bit tatty. 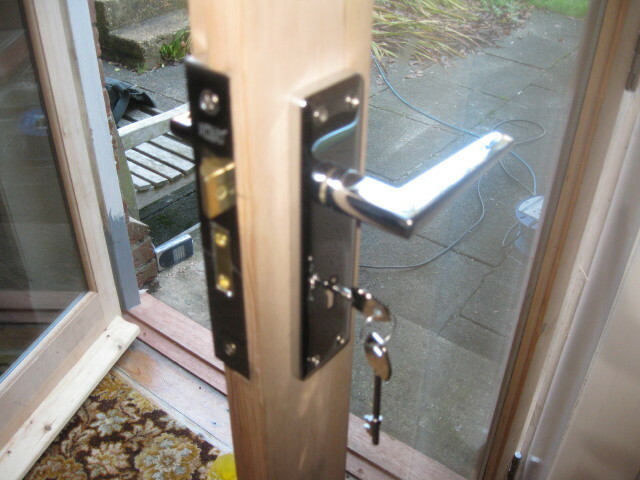 They are usually referring to previous locks that have been fitted and subsequently removed again, leaving holes. In most cases I can sort this kind of problem out by letting-in (fixing an insert) using reclaimed timbers to match. When it comes to styles, the choice seems never-ending, but bear in mind the function of the room when making your decision. If it’s a bedroom, then maybe the hollow 6 or 4 panel doors are fine, but you may wish to consider a ‘safe and sound’ (filled-in) format as this gives a certain amount of acoustic protection and feels more solid. 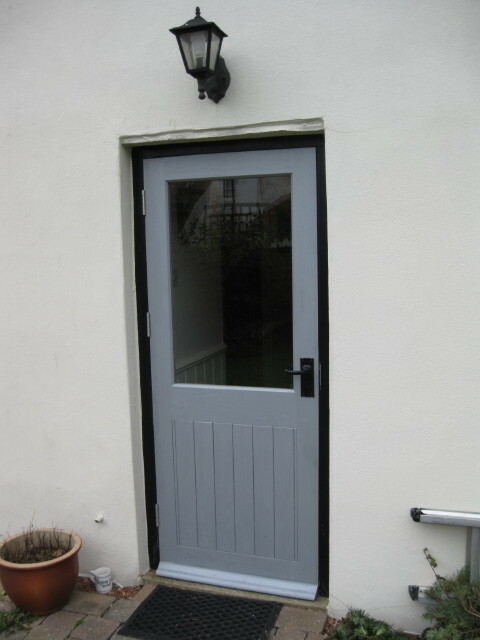 A kitchen door may need to be part-glazed or maybe a fire door. Living room doors should be ‘safe and sound’ to keep the noise from the TV out of the rest of the house. 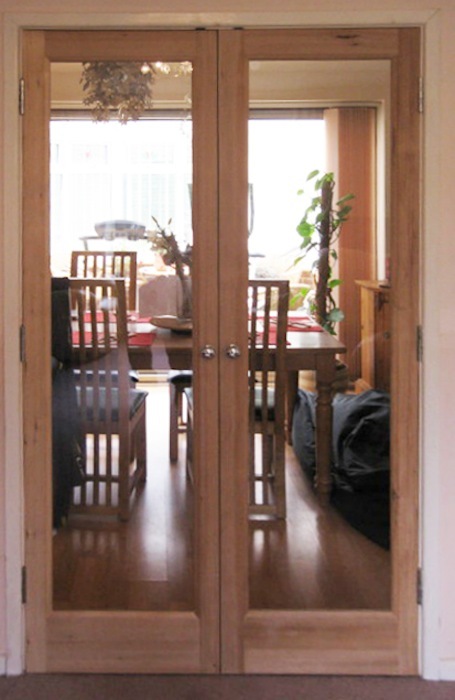 You may be pushing the boat out and considering oak veneer or hardwood internal doors. These can look fantastic against sympathetic décor, but bear in mind that commonly these have only a 6mm lipping (the edge), so if more than 5mm needs to come off the sides they may require a suitable veneer. Whatever your requests or ideas, I am happy to advise you on suitability. If you want to change your main entrance door or back door, consider please the old adage: quality endures long after price has been forgotten. It usually costs no more in labour to fit a quality door than an inferior door. Look out for ‘M&T’ on the label which stands for mortice and tennon; this is the method of construction that is both traditional and strong. Cheaper doors are doweled and will not last. A quality hardwood door, properly painted or stained and periodically maintained, will last for many years. Main entrance and back doors are usually 32” or 33”, and always 44mm thick. 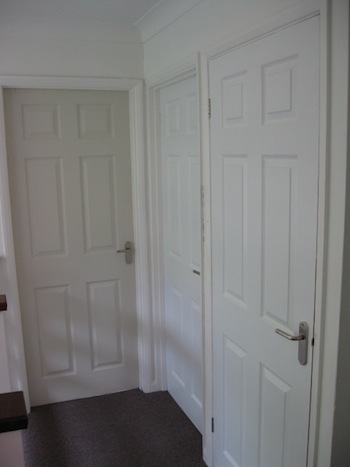 Again, older properties may have narrower or wider doors, the 3ft Regency or Victorian being examples. Should you go for solid or veneered hardwood? Most hardwood doors are veneered. They are engineered with particulate stiles and rails, and the panels are often plywood with a veneer overlay. This is a perfectly acceptable method of construction. You could choose solid hardwood but I can see no clear advantage. Softwood for a back door is often the choice people make, but it will need a bit more in the way of maintenance. 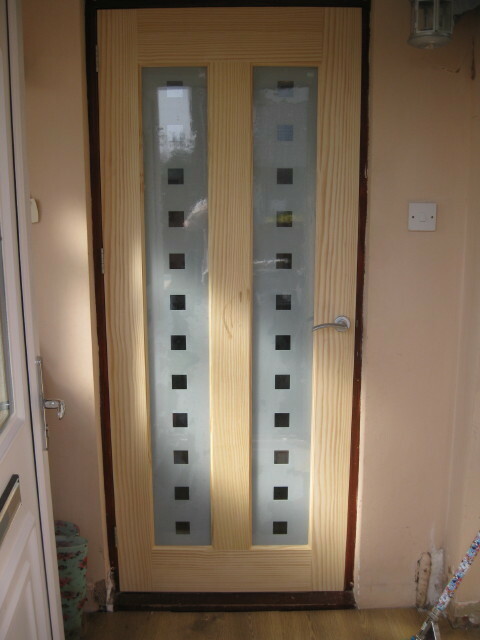 A typical back door design is the half glazed and half panel design. Beware – the panel may be only 6mm plywood: one kick and they’re in! Remember, intruders prefer privacy as they go about their business and that 6mm panel is no defence. I always remove this type of panel and fit a replacement 18mm one glued and fastened in place. 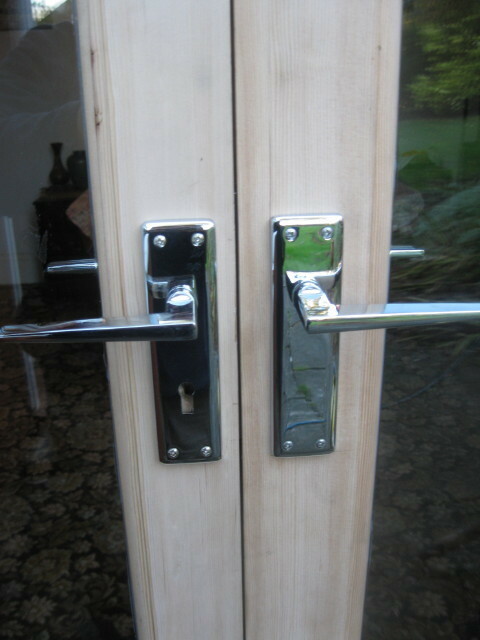 With regards security, the main entrance should have a dead-locking night latch, so that if some one breaks the glass they cannot operate the latch without a key, and an insurance-rated mortice lock. These should be fitted as far apart as is practical to spread the locking points, and if it’s an outward opening door, there should be hinge bolts as well. 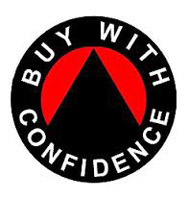 I went to a customer once who had been broken into; they had an outward opening front door fitted with 3 locks, but the intruder had simply removed the hinge pins and the door had literally fallen out! They had no hinge bolts. Similarly for the back door, there should be at least an insurance-rated mortice sash lock and a top and bottom surface mounted bolt, but ideally a mortice sash and a mortice dead lock. All this security is great, but remember “it ain’t no good if you don’t use it”. I am able to visit and advise you on any aspect of door maintenance, repair or replacement and am happy to supply and fit, or fit only. 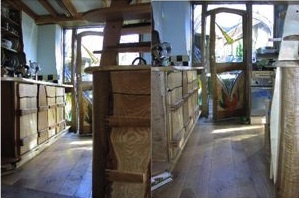 This is an example of some doors I designed in a customer’s kitchen mainly using oak with some ash.